The Treasury Department sold $8 billion in 10-year Treasury Inflation Protected Securities on Monday at a rate of 1.920%. Bidders offered $2.51 for every dollar of debt offered, the highest so-called bid-to-cover in at least seven years. Indirect bidders, a class of investors that includes foreign central banks, bought 49.7% of the sale. In January, they took 47% of the sale. Not much longer that I published that last article then did I see this Reuters story come over the wire about a trucking company needing a bailout for its retirement pension because of bad investments in either CMBS (Real Estate) or CDS (Debt Insurance) type financial instruments. The more these reports keep coming out, the more I can feel the coming bout of inflation coming because of the massive money printing that is taking place which will push our trading partners to increase their prices on wholesale goods to compensate for our reckless social policy of bailing out no matter if they were doing the right or wrong choices at the time. It is pretty sad the precedence this country has set for itself. I can just see the next crisis coming up once the dust settles and greed kicks in to find another way to exploit the system. Struggling No. 1 U.S. trucking company YRC Worldwide Inc. plans to seek $1 billion in bailout money from the Troubled Asset Relief Program to help it cover pension obligations, a move analysts say is unlikely to succeed as the company has no financial charter. Well between Obama giving the GM CEO the boot and the Federal Reserve having to purchasing more of our debt, the market is down sharply (over 4% at the time of this writing). It is becoming clear that we had a “bear-market rally” last week and these rosy predictions were much too early and now the reality of what is happening is becoming clear. Who really thinks once the economy turns around, the Fed is actually going to retract all the credit they have let, not I? We should know that if that happens, the economy will collapse again so that tells me we are going to see a heavy bout of inflation that has the possibility to destroy the currency. I advise everyone to proceed with caution and trust your gut, it will mostly likely give you the most honest assessment of the situation. U.S. government debt prices rose on Monday as heavy stock market losses and the threatened bankruptcy of two major U.S. automakers whetted investors’ appetite for safe-haven government debt. Key Wall Street stock indexes were down more than 3 percent as the Obama administration forced out General Motors Corp’s CEO, pushed Chrysler LLC toward a merger and threatened bankruptcy for both. Dr. Krugman is correct, this does seem like the “trash for cash” plan from the former administration. What is the point to bring in private capital to purchase these bad assets if they don’t even need to make good on the debt the government is financing if you can just walk away when it goes sour? I would like to see a list of assets they are selling. Unless they are mortgage-backed securities, I don’t see what else could have much value. Maybe some derivatives that are still good but then you are getting the market is at bottom and more defaults are not on the way. What I think might be really happening is that this could be away to get these assets / liabilities off the balance-sheet and when they go bad, the government will take them back and not the bank so in the end it will be our problem with a nice foreword that states we tried something that is a market-based solution. 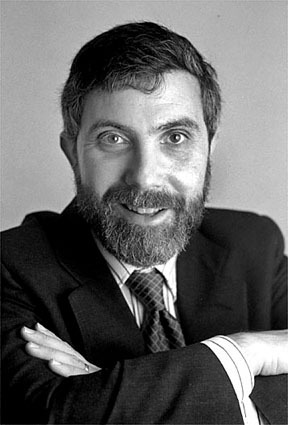 Nobel-prize winning economist Paul Krugman said in remarks published on Monday that the latest U.S. Treasury bailout program is nearly certain to fail, triggering a sense of personal despair. U.S. Treasury Secretary Timothy Geithner on Monday unveiled a plan(Bloomberg Whitepaper on Plan) aimed at persuading private investors to help rid banks up to $1 trillion in toxic assets that that are seen as a roadblock to economic recovery.